During my last session of re birthing breath work with Judiana, I finally re experienced my birth. I now understand where a lot of my fears and strange emotions come from. I felt a strong urge to go back to the place I was born, Pontotoc, Ms. Pontotoc is a very small town in north Mississippi. I was born there in 1960. My mother still has my grandfathers home there and the 100 acre farm. She need to go down and pay some bills so i volunteered to go in her place so I could attempt to reconnect and get a better handle on these strange emotions that came up. I drove my dad’s Ford Focus to save fuel costs. The little car was surprisingly comfortable and very fun to drive. I got about 30 MPG – way better than my Jeep. Driving alone gave me plenty of time to think and enjoy the freedom of going the way I wanted to go. I stopped by Russel cave and Point mallard along the way. I spent some time driving around the back roads of Pontotoc and around our farm. I read the book You can heal your life by Louise Hay. I have used the healing chart for a while but I had never before taken time to read the whole book and do the exercises. Being back at my birth place helped me to do the exercises of remembering or imagining my childhood. While I have many fond memories of growing up on the farm, there are lots of troubling ones as well. The feelings of separateness and of never having enough money came up heavily in my memories. Also, I noticed some strange negative feelings about money. I am sure these are the root of my financial problems toady. As I worked through the exercises in the book, I realized I have a lot of unexpressed anger. I suspect i am manifesting this as annoying people in my life. I find that I am increasingly annoyed by my friends and others in my life. I don’t yet fully understand this but I know that whatever i am experiencing in life is simply a reflection of my inner thoughts. I am beginning to get a handle on the ager that I have long repressed. I learned this anger at a very early age. I still have a ways to go on learning to release this anger. However I am sure just being aware of it will help greatly in ridding myself of it. I had thought it was just fear but it is really anger. I have done such a good job of repressing this anger that I do not even consider myself to be an angry person. But I do keep noticing fevers, and other illness that are caused by anger. Also the increase in annoying people in my life is the tripping point that made me look deeper. As I learn to release this anger I expect to see an improvement in my health, my relationships and my financial situation. I have been reading bout how having a powerful emotional attachment to something causes it to appear in your life. The law of attraction and other similar principles build on this basis. As my primary focus of 2009 is to improve my financial status, I have been looking at my emotion triggers about money. My first observation about myself is that I just don’t get that excited about having or making money. I remember my grandfather Callaway got really excited about making money. The highlight of his month was opening his bank statements to see how much interest he had earned. His favorite years were during the carter administration when his simple bank accounts were drawing 14 percent interest. He got so excited about seeing his bank account grow that he never gave a care that prices for things had gone up faster than his bank account. He truly loved making money and he did. I was very happy for his savings after he passed away. I am still enjoying the new Jeep Cherokee I bought with my inheritance money. While I do enjoy the things money can buy, I just can’t get too excited about the money itself. In fact I really enjoy creating things on a limited budget. For example, my off road Jeep is built with stuff that I have created myself or have sourced form inexpensive sources. 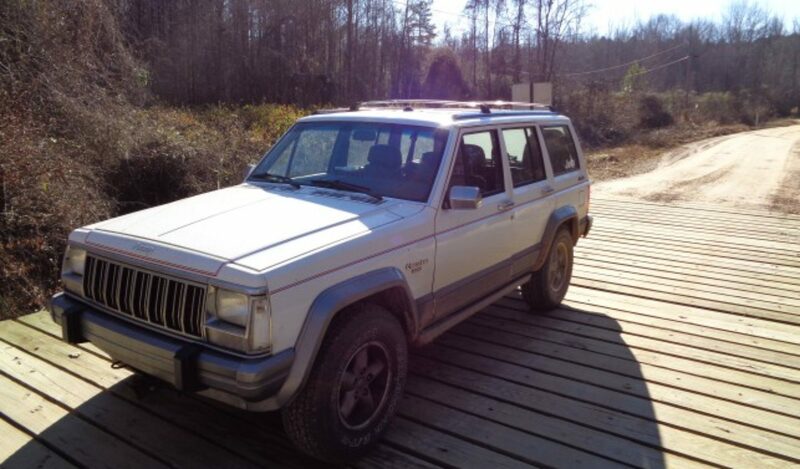 I take great pride in being a member of the Cheap Bastards Club on the XJlist forum. I sometimes feel that if I had more money that I might not be as creative. I might just go buy parts for my Jeep instead of making them. Looking at the opposite side of the issue however, I have a very strong emotion response to the lack of money. I have huge fears of going broke. My fears of loosing money are so string that when I first lost my job with Westvaco, I broke out in hives. The red spots on my skin expressed the fear that I could not express verbally. Often when I look at my dwindling checking account and my falling stock values, I feel a strong emotional response. I really don’t want to be broke. I like having enough money to buy gasoline, electricity, food and internet connections. My study of the Law of attraction as well as Napoleon Hill’s Think and Grow Rich show me that where ever I have the strongest emotions that is the direction that events in life will lead me. I am now working to turn this situation around. I am taking action on two fronts. I am using my fear of poverty to inspire me to act. I am pushing forward in several areas at once that have the potential to deliver income. I am also working to take my focus off of making money and on creating value for others. I love helping others and I can generate plenty of emotional energy into creating something to help others. This blog is one example. I hope that what I write here will be of benefit to other people. I know that if this work proves valuable to other people, I will find ways to monetize it. I am working to also change my attitude about rich people. In the past I have seen rich people in a very negative connotation. Defiantly not something I wanted to be. Now that I understand that people become rich not by stealing form others but by providing value to others. Even the bootlegger that I grew up near was only providing a service to her customers. She simply gave them what they wanted and they gave her money in return. While I don’t think that is the kind of service I want to provide, I now see that she was not evil, she was simply providing a service that people wanted. She delivered value to her customers and was financially rewarded for her efforts. It is my desire to provide valuable service to my readers and coaching clients. I desire to use my skills, knowledge and experience to help other people improve their lives in any area they choose to focus on. I have a great deal of experience in a wide variety of fields and I know I can help people who wan tot be helped. By focusing on creating value for my readers and clients, I will be shifting my focus off my fear of being poor and more toward creating value. If what I have experienced so far with the law of attraction holds true, I expect to see financial abundance follow soon after I make a shift in my thinking. I will keep you posted on the results.